When it comes to body contouring, we’re pretty sure you’ve heard the words truSculpt or CoolSculpting. Followed by that is usually terms like “melt the fat” or “freeze the fat” when referencing these body sculpting technologies. And often times this is where confusion sets in. Because there’s much debate on which body contouring technology is better and more effective — to melt fat or to freeze fat. Not only is this one of the big questions in medical aesthetics today, but it’s also on the minds of many potential clients looking to contour their body without surgery. We know you want to target those areas on the body that can be stubborn and don’t want to let that fat go no matter how hard you exercise or eat right — like the abdomen, flanks, back, arms and even the chin area. But how do all of these body contouring machines compare? Usually well tolerated; little to no discomfort. • Effectiveness of truSculpt iD®? Up to 24% permanent fat reduction. The flexibility of applicators allows for multiple areas to be treated including chin, arms, abdomen, flanks, thighs, knees and the back area. • Treat BMI Over 30? 105 minutes to treat same area. Due to the suction-based applicator + post-treatment massage this can get uncomfortable. Up to 22% permanent fat reduction. Up to a few weeks of potential numbness, nerve pain and uneven results of the treatment area. Potential limited treatment areas based on the design of the applicator (which is suction-based). Now you’ve seen the comparisons – to melt or to freeze – those stubborn areas on your body where no amount of jumping jacks, lunges, hot yoga sessions and green smoothie sipping can help. Call us bias (we LOVE our truSculpt iD® technology), but it looks like if you want to maximize your time, increase your potential for permanent fat reduction, experience little to no discomfort during the body contouring treatment and tighten your skin while treating your problem areas – truSculpt iD® has you covered in all of those areas and then some. Does body contouring without surgery have your interest? Call RENEW | 719.423.0083 to schedule a consultation or REQUEST AN APPOINTMENT below to get started! We send you our latest blogs + specials + events straight to your inbox. Have you looked in the mirror lately, ran your hands over your neck area and muttered the words, “ugh, turkey neck”? What if we said there’s a non-surgical facelift treatment to help not only the dreaded turkey neck (sagging skin), but crow’s feet and deep wrinkles as well? And this treatment can be done during your lunchtime…(what?!). This skin tightening procedure is called Forma (by InMode) and not only gives you the option of a non-surgical facelift treatment, but also allows for an in-office procedure with little to no downtime. Ok, let’s get into the details, shall we? What is Forma for Skin Tightening? Ok, so what does all this radio-frequency and electrodes talk really mean? It means that Forma is your non-surgical treatment superstar for face tightening, deep wrinkles, and collagen stimulation. Now that you know you don’t have to go under the knife for that saggy skin, what can you expect from this Forma procedure? 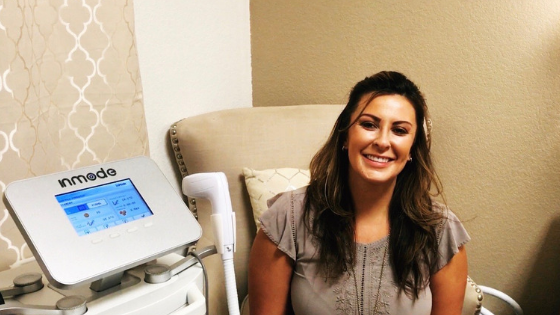 Unlike going under the knife (and anesthesia for that matter), Forma only requires an in-office visit with your skincare professional and less than an hour of your time. Hence why they call this the “lunch-time” procedure. You may experience some warmth or slight tingling during the Forma treatment, but nothing that should be highly uncomfortable. Over time your skin can reveal a more youthful, glowing appearance that doesn’t involve bandages on your face from going under the knife. in this video charmayne torres-trujillo talks about forma for skin tightening and the potential results for this “lunch-time” procedure. If you’re looking for a solution to sagging skin, crow’s feet and/or deep wrinkles, but don’t want an invasive procedure – Forma by InMode is your “lunch-time”, non-surgical facelift treatment solution! With little to no downtime and potential results that include a tighter and younger-looking appearance, Forma could be just the skincare treatment you’re looking for. Say so long to the “gobble, gobble neck” and save your turkey for Thanksgiving. If you’re ready for skin tightening that doesn’t require going under the knife, request an appointment today to get started or call 719.423.0083 to schedule a FREE consultation. SUBSCRIBE + DON'T MISS OUT! Sign up with your name and email address to receive RENEW NEWS (blogs, product features, events and more) straight to your inbox. What is PRP and how does it rejuvenate skin? PRP is an advanced treatment technology that utilizes ingredients present in an individual’s blood in order to regenerate their skin and revitalize collagen, leading to healthy, young looking skin. Scientific studies have proven that PRP generates new collagen when infused into the skin and the most recent studies reveal that PRP can ease sun damage as well as aging skin problems. To learn more about PRP and to see a special demonstration, attend the Open House | Fall Edition on Wednesday, September 21, 2016 from 6 - 8 PM at the Renew Medical Aesthetics & Laser Center. For more information and directions please see the Open House Invitation. Under the guidance of Dr. Zein Obagi, ZO Skin Health, Inc. has developed a wide spectrum of therapeutic treatment protocols and daily skincare solutions that create and maintain healthy skin. Based on the latest advances in skin therapy technologies -- unique delivery systems, bio-engineered complexes, and exclusive formulations -- these products and protocols help physicians provide continuous skin health for all skin types, genders, and ages. ZO Skin Health, Inc. identified new bio-engineered complexes and utilized plant stem cell components with antioxidants to create unique formulations in multi-therapy delivery systems that have not been available until now. ZO® Medical therapeutic products and protocols have been optimized to treat a wide range of skin disorders and chronic conditions. A wide range of products, regimens, and programs help maintain the results of therapeutic treatments, and provide effective daily skincare and protection from the environment. For more than 35 years, Dr. Zein Obagi's progressive ideas have defined the science of skin health. Today, his innovative new protocols, guidelines, and treatments for creating and maintaining healthy skin are available through lectures, personal consultation, and comprehensive ZO® training programs. To learn more about how ZO can help you 'get comfortable in your own SKIN', contact Dr. Elijah and the RENEW Team today at TEL 719.423.0083 and schedule your personal evaluation.